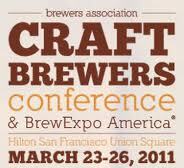 The Craft Brewers Conference in San Francisco March 23 – 26. Be there. For professional brewers, CBC is the number one environment in North America for concentrated, affordable brewing education and idea sharing to improve brewery quality and performance. The conference is also a great social event with over 2,600 brewing industry professionals enjoying craft brews together. BrewExpo America® allows exhibitors and buyers to develop profitable business relationships and helps brewing and brewery restaurant professionals encounter the latest and best products and services that industry vendors have to offer. Don’t miss out on this fantastic opportunity to be a part of the 2011 conference and trade show for the brewing and brewpub industry! Registration will be open in December 2010.